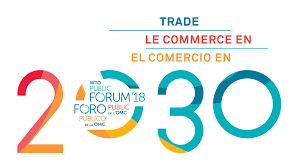 TradseSifters Michael Gasiorek and Peter Holmes along with UKTPO friends Ilona Serwicka, Alan Winters and Alasdair Smith attended the WTO Public Forum this week. Ilona, Alan and Michael spoke at this UKTPO side event on Trade Wars at the Graduate Institute hosted by @Richard Baldwin. TradeSift calculations by Julia Magntorn showed that although 75% of US-China trade was affected by new trade measures, this only amounts to 2,5% of total world trade, and in fact 2% of trade in the affected products. If this trade were diverted to other markets the EU is the most likely target. The descriptive data introduced a more in-depth partial equilibrium analysis, using a PE tool developed with our colleagues at the University of Sussex. This showed that using a ”profit shifting” analysis it did pay China to retaliate, though the PE calculations showed that China could have achieved the same impact on the US at lower cost by a different choice of target sectors. Richard responded by noting that unlike earlier trade wars the present situation was leading other countries to liberalise with each other rather than escalating barriers against one another. The Public Form and Annual Report focused on trade and new technology especially digital. We were delighted to see reference in the Report to work of Maria Ptashkina with Dan Curiak on regulation of data flows. Trump policies cast a big shadow over the whole event: how to address the concerns of the apparent losers from globalisation without resorting to protectionism was a big theme. A session on digital competition policy problems was hosted by the WTO Centre IIFT Delhi and it was a delight to meet our old TradeSift friend Prof. Abhijit Das, as well as many other friends and collaborators including Pradeep Mehta (CUTS) & Lucian Cernat (DG Trade). BLOG | Goods In - Services Out: Can the UK walk on One Leg?